New shipment came in today. Newer crop from higher elevations. Small size: Below about 1.5 inch diameter. Medium size: About 1.5 to 2.5 inches diameter. Just started. Nice aromatic, Trumpet shaped, medium sized. 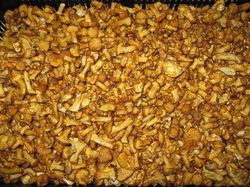 Chanterelles should be available from various areas until the end of the year. New, limited crop from South-East Europe. Sold out until next Monday. Beginning of the season. Should last until late October. The best of all Morels. Gorgeous. Good flavor. Do not crumble. Good shelf life. No bugs. Montana. Should be available until Mid-August. The wild cousin of blueberries with it's own unique flavor. From Oregon. The sweeter of the two varieties. Great for desserts. The smaller, coastal variety will start later in the summer. Wild green from the salt marshes of Oregon. Great as a tasty, lightly crispy somewhat salty accompaniment to seafood. Full of nutrients from the ocean. Cultivated in Panama. Organic (not certified). Peeled, washed and 100% of it ready to use. Please contact us to for a complete list. 17 SPECIES OF CULTIVATED MUSHROMS. Nice, yellow and clean. Perfect moisture content with an excellent aroma and flavor. Season should last a few more weeks, which is when the domestic Chanterelles are expected. If the weather cooperates, Chanterelles should be available through late December. 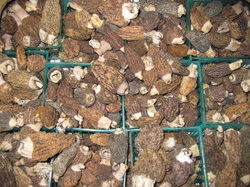 Considered the best of all Morels. Great flavor and aroma. Sturdy to handle and good shelf life. Season could last in to mid-August. Very good aroma and flavor. Also called "Burn Morels", From an area, which had a forest fire last year, which makes them insect free. Season should last a few more weeks. Excellent. As good as they get. Bouchon / cork sized (2-3" diameter). Firm, dry and good to slice. Some are split in half to check for insects. Should be available at least a few more weeks. Hans showing us Chicken of the Woods mushrooms up close in the wild, and tells us a little about finding them, choosing the tastiest ones and how to prepare them. CALL US AT 914-682-7288 FOR MORE INFO. OREGON MUSHROOM SEASON IS IN FULL FORCE! Prices are dropping. Quality is excellent. Should be around at least until mid December and often until mid March (from California January to March). Safe to put on your menus. ~Premium: 1 - 2 inch "buttons" (younger mushrooms with a cap shaped more like a shiitake as opposed to more developed ones that are vase or funnel shaped). ~Mixed: All sizes. Not as picture perfect as the Premium, but all nice and usable. ~White Chanterelles: In the chanterelle family, but a different species. More meaty and a bit peppery taste. White inside only, since they turn yellow/golden real fast after picked. Should be available from Europe until early to mid December, when usually the domestic season starts and lasts until mid to end of March. Safe to put on you menus. Good supply from Oregon. Should be available until early to mid October. We only buy the small/medium firm and drier ones that have no bugs in them. Safran or green apples bring out the flavor in these, according to one of our customers. Should be around until early December. Prices may go up in October, depending on the demand from Japan. This week we have the small #1 shaped (tight drop shaped unopened caps). In a week or two we should get the more open, cheaper ones. CAULIFLOWER (Oregon) Starting soon and available in limited quantities until early December. BLACK TRUMPETS (Europe) Should come soon. Hopefully available until December, when the domestic season should start. YELLOWFOOT CHANTERELLES (Europe): Same as Black Trumpets. PORCINI: European season potentially now until end of November. The domestic season is usually early/mid October until early November. ~Mountain variety. Sweeter. Look more like a blueberry. Near end of the season. ~Coastal variety. Season just started. Should be available until early November. Safe to put on the menu. SEABEANS. WILD: Near the end of the season. 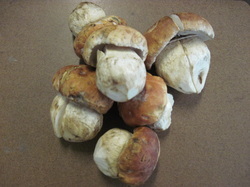 1: A growing resource guide with pictures and descriptions of our mushrooms and other specialties we distribute. c) recipes and more. We hope you will find it useful. Be sure to check out our Seasonal Availability charts and check back for our product descriptions.